Friday September 17th 1926 I was sewing for myself in forenoon. At two oclock Mr Albers came to take me to the dentists. Had tooth filled. Then went down to Mrs Varneys to missionary meeting. Will Duncan took me for a ride and brought me home. Saturday September 18th 1926 I was busy with my own affairs in forenoon. I began another rug in the afternoon. Laura was in Peoria for the day. Weather very warm. 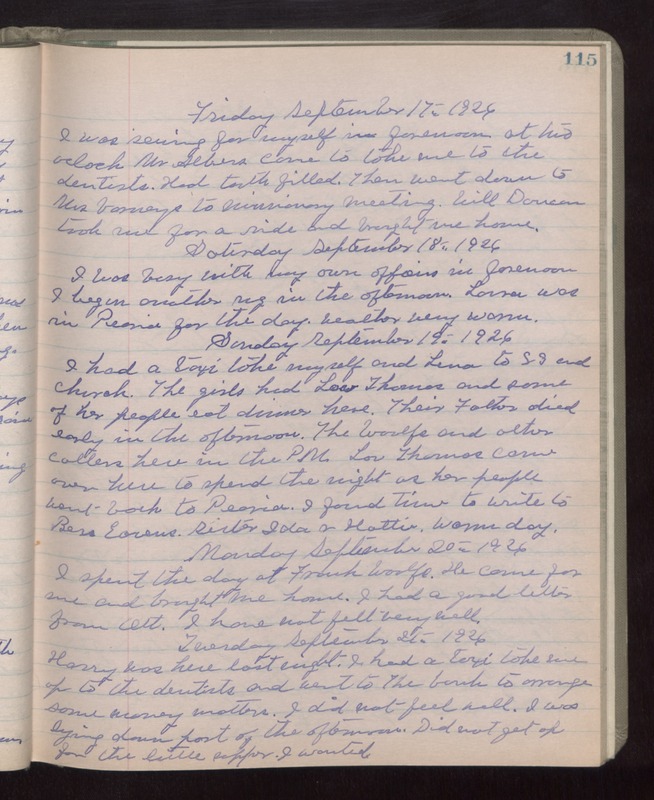 Sunday September 19th 1926 I had a taxi take myself and Lena to S S and church. The girls had Lou Thomas and some of her people eat dinner here. Their Father died early in the afternoon. The Woolfs and other callers here in the PM. Lou Thomas came over here to spend the night as her people went back to Peoria. I found time to write to Bess Eavens, sister Ida, & Hattie. warm day. Monday September 20th 1926 I spent the day at Frank Woolfs. He came for me and brought me home. I had a good letter from Ott. I have not felt well. Tuesday September 21st 1926 Harry was here last night. I had a taxi take me up to the dentists and went to the bank to arrange some money matters. I did not feel well. I was lying down part of the afternoon. Did not get up for the little supper I wanted.